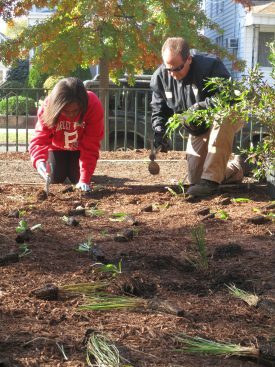 Share the post "Water Resources Program Partnership with PVSC Earns Utility “Forward Thinking” Award"
Rain garden planting at Horace Mann School in Bayonne. In order for New Jersey municipalities to alleviate localized flooding, protect and improve water quality, and prevent processes that cause untreated wastewater from entering local waterways, targeted efforts using green infrastructure are needed for the management of stormwater runoff and nonpoint source pollution. The “Clean Waterways, Healthy Neighborhoods” endeavor earned Passaic Valley Sewerage Commission (PVSC) a 2018 “Forward Thinking” Wave Award from the Association of Environmental Authorities (AEA) at its 2018 Recognition Luncheon, March 13-14 in Atlantic City. The Association of Environmental Authorities (AEA) is a non-profit professional organization for the managers of the water, wastewater, solid waste and improvement authorities statewide. AEA’s Forward Thinking Award recognizes regular or municipal member innovation. It is presented to AEA members that adopt successful new approaches or techniques in use of technology, facility design, or management. 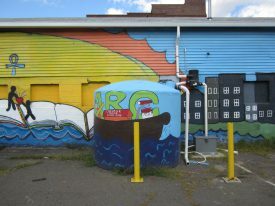 A cistern to store rain water was installed at Paterson School #5 for its community garden. Working in conjunction with the Water Resources Program on community outreach, this project has helped inform the public on how green infrastructure can be utilized for stormwater management. It has achieved this through workshops, the development of nearly 40 municipal green-infrastructure feasibility plans, and seven demonstration projects, with three more planned for 2018. The goal is to create and utilize a branding that would help encourage the public and the municipalities to embrace the area waterways as a resource that can improve the health of their communities, and in turn, to win their support for investing in clean water infrastructure through improvements to the wastewater treatment plant, CSO and stormwater controls. In addition, the Clean Waterways, Healthy Neighborhoods project helps showcase PVSC as a steward of the Passaic River, committed to investing in and improving the Passaic River as a resource to the region. This extended effort to shape public perception and understanding will benefit the community for years to come. 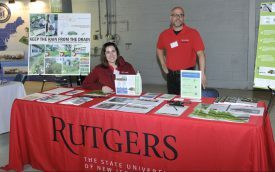 Rutgers participating in PVSC Municipal Day at PVSC in Newark. The Water Resources Program, directed by extension specialist in water resources Chris Obropta, aims to identify and address community water resources issues, using sustainable and practical science-based solutions. One of the program’s areas of focus is Stormwater Management & Green Infrastructure, which is realized through the partnership with PVSC, led by senior research project manager Jeremiah Bergstrom. Green infrastructure is an approach to wet weather management that is cost-effective, sustainable, and environmentally friendly. Green infrastructure management approaches and technologies capture and reuse stormwater to maintain or restore natural hydrology. 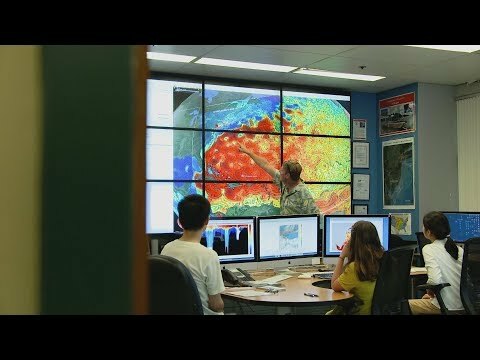 To learn more about this collaboration, visit http://water.rutgers.edu/PVSC/PVSC.html.